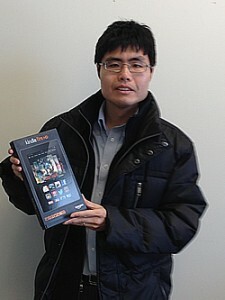 Congratulations to Dr. Lian Duan, Assistant Professor of Mechanical and Aerospace Engineering, for winning a Kindle Fire HD for attending EdTech U in Fall 2013! Dr. Duan is one of our newest faculty on campus, only arriving here in August 2013. EdTech U will continue in Spring 2014, but the hours will be changing slightly. EdTech U will be offered in Interdiscplinary Engineering (IDE) Room 105 from 2 – 4 p.m. on Thursdays, instead of from noon – 2 p.m. It is generally available during the semester every week when classes are in session. iPad U is offered on the first Thursday of the month when classes are in session from 2 – 3 p.m. in IDE room 104 (Faculty Center). A special session of EdTech U will be offered on Thursday, January 16, from 1 – 3 p.m. (extended hours) to aid instructors in preparing for Spring 2014 courses.